But that’s about to change. Here’s why. 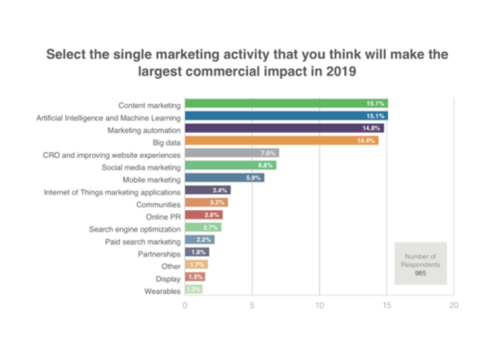 I recently came across a report, Managing Digital Marketing in 2019, published by digital strategist Dr Dave Chaffey co-founder and Content Director of Smart Insights. The digital marketing recommendations given in the report are based on over 900 surveyed businesses and how they use digital marketing today. When you look at the results of the Smart Insight survey listed above, it is interesting to see that good ole content marketing is up in the ranks with “futuristic” Alexa, Siri and Google Home. Nowadays “content marketing” can be a bit of a fluffy term used loosely to cover the content creation for all digital channels, ranging from search to email marketing to social media marketing. However, in its true meaning content marketing is having a strategic marketing approach that focusses on creating and distributing valuable, relevant, and consistent content that will attract and retain a clearly defined audience. So, instead of pushing your products or services, you are providing truly relevant and useful content to your prospects and customers to help them solve a problem or address their pain points – making content a cornerstone of your business model. It’s about pulling your customer towards you instead of pushing your products and services onto them. Strike the right balance and you’ll consistently see why content is king. Let’s step back in time, back to 2007… Facebook and Twitter were in their infancy, there were no data scandals and no GDPR, Apple had just launched the first iPhone… and as a sign of things to come “Google” had also just been added to the Oxford English Dictionary (i.e. verb: “on Sunday she googled an ex-boyfriend”). Life was a lot simpler. At the time, I was working as an editor for a health publisher in the UK. We had a small list of about 15,000 names and we had just launched our website. Our primary source of new names was organic search-driven sign-ups on our website. One of our main focus points to grow our business was to create high quality website content aimed at a niche market, with the aim to attract prospective customers who would want to build a relationship with our business (i.e. content marketing in its most primitive form). We invested a lot of time and energy into learning what SEO is and how to use it to our benefit. Organic search rankings were all the rage. Our efforts paid off and we became one of the highest-ranking alternative health websites in the UK, raking in organic names like there was no tomorrow. But like many businesses, ours was hit hard by Google’s Panda update in 2011. Panda was an SEO and organic ranking game-changer. Google developed it to reward high-quality websites and diminish the presence of low-quality websites in the organic search engine results. I also believe it was one of the reasons why digital marketers pushed SEO onto the backburner in favour of other marketing strategies that showed results a lot faster. Today, SEO is extremely competitive and the challenge for most businesses is to differentiate themselves from their competitors in a space where everybody does SEO in the same way – fighting for the same keywords with competing businesses copying Title Tags and employing grey-hat tactics to generate leads. This leaves a potential customer with questions like: How do I differentiate between who is trustworthy and who is not? Whose content can I rely on to be accurate and truthful? It therefor makes perfect sense that search queries have become longer and more complex. Users now also ask search engines questions that are much more conversational and reliant upon search engine’s ability to understand context (cue Artificial Intelligence and machine learning – no wonder it ranks at the top along with content marketing). In other words, SEO is not dead. It has simply evolved and has become more human. This is why the importance of SEO as part of your digital marketing strategy needs a rethink. SEO needs to be put at the heart of your content-marketing strategy – where your content is customer-focused, preferably with some educational authority (benefit-driven). 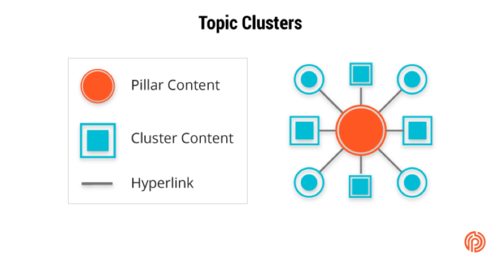 Pillar content (hub pages) and topic clusters is how you achieve this. A content cluster structure allows search engines to understand the relationship between different pages and determine which topics your business is an authority on. Topic cluster or pillar content focus on a particular topic instead of individual keywords. This means that you create long-form content as a centrepiece, which acts as the main hub of educational content, known as the “pillar content” or “pillar page.” Your pillar content covers all the keywords around a particular topic and includes links to individual articles and content pieces that are more detailed. Start by creating a content pillar page that outlines the topic you want to expand on. As you build your related content, you will always link back to the main topic, or pillar. To read how you can create pillar content that Google loves, click here. In addition to creating pillar content, your content marketing strategy should also include SEO strategies that will allow your content to show in search results that relates to “How-to” search queries, or the “People Also Ask” accordion box that appears just below the featured snippet and includes a series of questions related to a specific query. According to a recent article at Moz, PAAs have enjoyed a 1,723% growth in the SERPs, compared to featured snippets, which have only seen a 328% growth. Similar to creating pillar content, there is a science to having a “People Also Ask” ranking strategy, which involves keyword research, producing outstanding content, a great writing style, and on-page optimization. For step-by-step instructions on how to increase your chances of showing up in PAAs, click here. The bottom-line is, content marketing continues to be an essential component of digital marketing, especially when it comes to SEO. With an increasing emphasis on nuanced content, creating searchable quality content matters now more than ever. Not only will it show search engines that you have a sophisticated understanding of who your target market is but by applying specific SEO strategies your business will be able to precisely target your niche market – potentially yielding impressive results. For one, we know that SEO names are up to three times more valuable than Paid Search names. And in this age of transparency and multichannel marketing it is a big part of owning your reputation and plugging those leaky funnels.